Home > KMS, MapleStory 2	> kMS ver. 1.2.216 – World Cup & MapleStory 2 – Assassin! kMS ver. 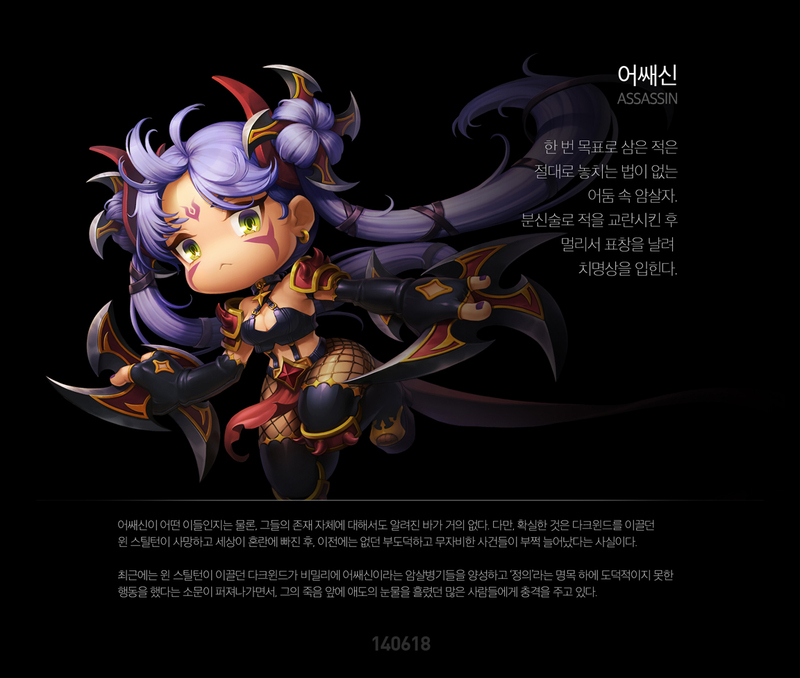 1.2.216 – World Cup & MapleStory 2 – Assassin! Sorry about the lack of posts guys, everything’s been so boring lately! There’s not even any information about the summer update… although they have mentioned they are working hard to finish the new enhancement system in time for summer. Speaking of which, they have made a few more changes but I won’t cover them I think, until it comes to the real server. Anyways, a new MapleStory 2 teaser was released, and some events for the real server, read on! Hmm… there’s only one more class left (thief i.e. chief bandit). I wonder what they’ll show us after that! Anyways, the first event is the Go for It! Korea!! 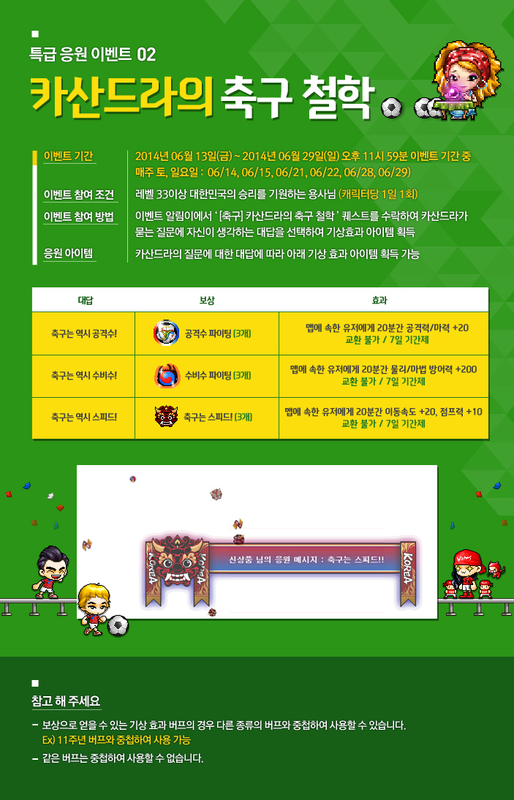 event, for the World Cup, and it runs until June 29. First of all, each day you can receive one of three sets of special cheering equipment! There’s two hat + overalls and one chair, but they all expire sadly. 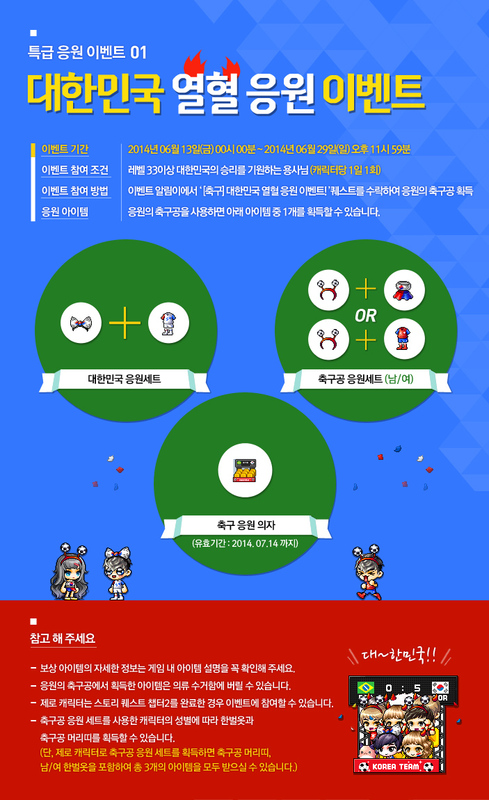 In addition, every weekend you can choose one of three weather effects to cheer on the Korean team! They give 20 attack and magic attack, 200 defense and magic defense, or 20 speed and jump for 20 minutes. Finally, if the Korean team wins their games against Russia, Algeria, and Belgium, we’ll receive 2x experience for 2 days from 5pm to 9pm! One more event which was added was season 2 of the Higher and Higher, Crown Stacking event! It runs until July 9. Just like last time, you’ll have to collect 30 Twinkling Stars from monsters around your level, which you can then combine to get either a completed Crown (random) or a Crown Fragment (combine 10 for a Crown). These Crowns will be one of five colours, with 10 possible messages for each colour. If you work hard and are able to collect many Crowns, you’ll receive prizes! You can get one prize for each colour of Crown that you collect all 10 for, and then a grand prize if you get them all! Finally, Cassandra will give you a special sentence to create with your Crowns. If you are able to gather the required ones and show her, you’ll get the Crown Stacking Master medal which gives 5 all stats, 300 HP and MP, and 3 attack and magic attack (but the stats expire after 30 days). Random (and sort of shameful) plug, you guys should try out League of Legends! 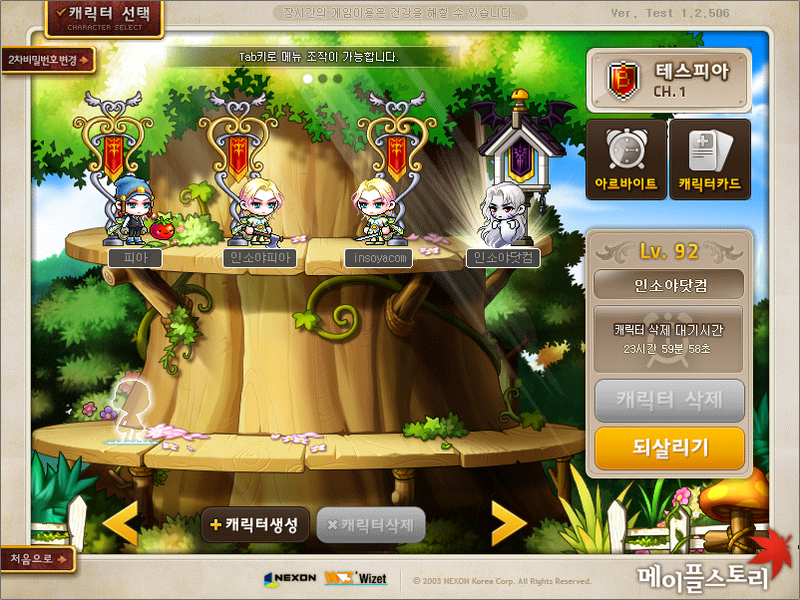 I have a lot of fun with this game, and I play it a lot more than MapleStory haha. Cheating to third is always nice. Am I the only one who doesn’t like LoL? Anyone here wana mention the thunder thighs she has? Wow. So even Max falls victim to the snare that draws me away from MS? Lol. Which server do you use? (For League that is). Wait is this just for the original maplestory? Hey Max! Do you know which director left or got fired? Because there’s a new guy in the development team. Do you know which director got fired or left and got replaced by this guy? I wish NEXON new what they’re doing. Nowadays Maplestory is arguably less enjoyable than ever. AHH THE TONS OF MEANINGLESS CONTENT. No wonder evan Max has forsaken it in favour of League of Legends. Agree. But she is the sexiest as far :3. Max what’s your Summoner Name? no major updates for the summer? 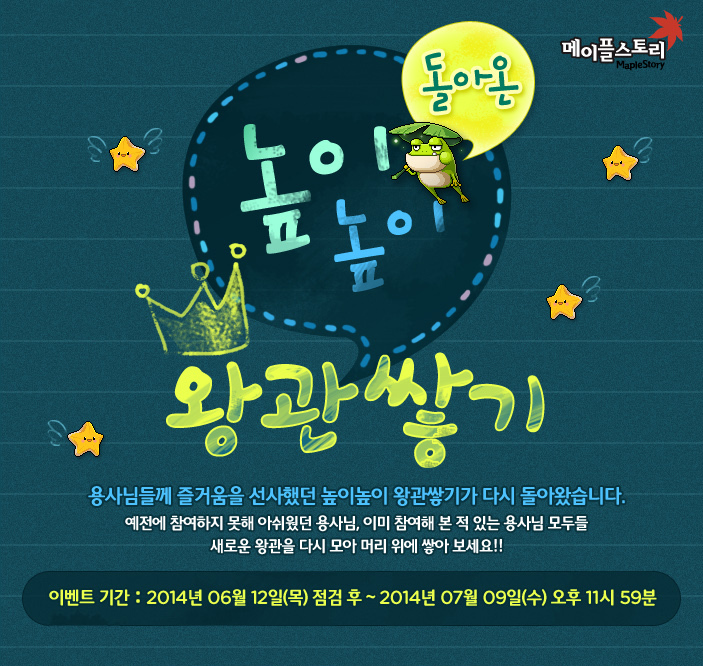 MapleStory Summer 2014 & MapleStory 2 – Thief and Supporter’s Day! 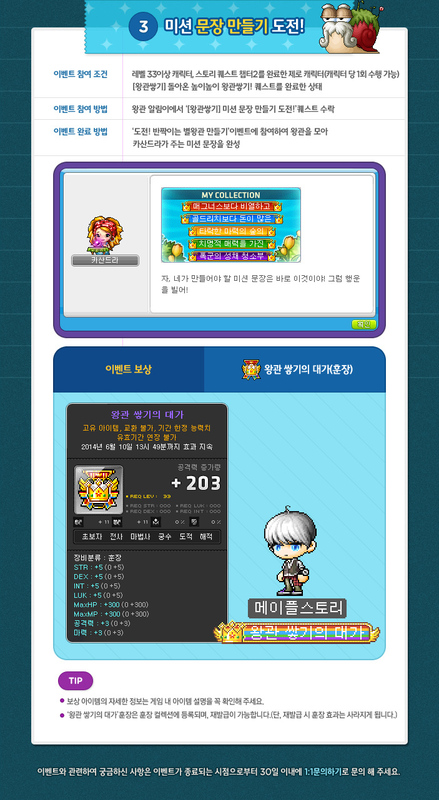 MapleStory 2 – Heavy Gunner & kMST ver. 1.2.506 – Deletion Standby!